Don’t Click! ‘WhatsApp Color Change’ Link on WhatsApp Is A Malware; People Report Data Loss! If you are regular on Whatsapp, by now you might have received the text from someone or on a group claiming that how clicking on a link would enable the option to change the colour of your Whatsapp application. Surprisingly the link went viral, where the endorser is asking the clicker to share the link to different other groups and contacts, which will finally enable the option of choosing your favourite color for your Whatsapp application. The link is nothing, but a malware luring users to click on it and tricking them to share it with others and generate more buzz. It has been doing multiple rounds on the social media now and also on WhatsApp, where it originally originated. There are several other such malicious links available on the internet which tricks users with such appealing features and lure them to install malware on their devices. Though such links don’t spread on such a wide basis, as most of them are short-lived and soon get taken down by cyber security controllers. This color changing link came out to be an exception and it got viral in a fortnight. 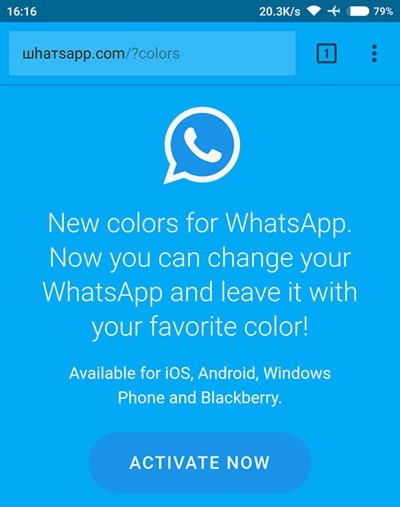 They claim to change the color of your WhatsApp, though when you click, it only installs an unknown adware on your device. Though when you finally share the link with your contacts and groups, their next pop up shows a message, which says that the different color can only be used on a computer, where your device needs to have Chrome as your browser and you should add the required extension. The malicious link will redirect you to a website named www.blackwhats.site, which is basically a suspicious adware based site. There have been reports of data loss, as clicking on such links lead to straight transmission of malware to your device, which makes the device easily vulnerable to any kind of attack. How to Keep Your Device Safe from such Malicious Elements? It’s a very basic thing that WhatsApp hasn’t got that much time to send you texts to invite you to update their platform. Anyone who has been around the internet for some time, know that the link is fake, but still how they trick and lure people as it seems very much convincing at the beginning. Do not click on any kind of unknown or suspicious link. Whatsapp will not send out any kind of text message in case there is an update. Do not forward any such kind of spam texts, which attracts unnecessary attention. Keep your smartphone safe with a reliable antivirus, which can shield the device from any such attack. It’s better to stay away from such spam texts and refrain yourself from sharing such messages. How to Avoid Accidental Data Loss? Whatsapp has got all the important texts, information, pictures and data. The platform is one of the most used platforms around the world to communicate and share data, which makes all the data on the app really important. Any kind of Data Loss can be a big disaster for anyone. Such malicious links sometimes lead to data loss, where even personal data isn’t even spared. To prevent such accidental data loss, the best resort is to keep the Everyday Data Backup option on, and keeping an everyday backup of your important data. This can safeguard all your data, where you can make sure your data is safe and secure. "Don’t Click! ‘WhatsApp Color Change’ Link on WhatsApp Is A Malware; People Report Data Loss", 4 out of 5 based on 10 ratings. Reliance Jio Strongly Objects To Airtel-Tikona Merger; Claims This Will Lead To Rs 217 Cr Losses To Govt!